It's that time of the year again in North Central West Virginia, Preston County is getting ready to start the 2010 version of the Buckwheat Festival today. Buckwheat cakes I guess are an acquired taste, and it has been one that I have definitely acquired. I'll need to somehow make it up to Preston County in the next few days so that I can partake on my yearly Buckwheat Cake and Sausage Dinner. I'll also be busy watching Haley perform Sweeney Todd at the Met Theater this weekend. I'm not sure when we are going, but if anyone would like to go with us, it's for a good cause and Hayley would love the support. Surprise, two years in a row I have remembered one of my most loyal readers birthday. Ironically next year Michelle and I are going to give him to scratch something off of his bucket list, but today I am going to wish Bill a very Happy Birthday. I would put the word out to all of his co-workers to wish him a Happy Birthday, but I think we all know that he is playing hookie today. Well we have made it through the first two days of the week, now it's just time to get over that hump and start our downward journey towards another weekend. It's been an eventful week for me at work to say the least, but things are working out better than ever and I am as we can say swamped right now with some requests and it looks like my days may even be getting busier. What happened to Summer? Did someone hide it? * It's Tuesday, can't think of a better reason to do a tidbits than that. * 928 Days since mine and Michelle's first date. * 151 days since I proposed and she said yes. * 88 More shopping days till Christmas. * 313 days left of the single life. * Michelle finally made it back to work yesterday after being off the better part of last week. She still has some stomach problems, but for the most part she is doing much better. * I upgraded my picture site a few weeks ago and noticed that my favorite template is not really that compliant with it. Maybe I'll have to switch a few things up on the overall look. * Maybe I can get a chance to sit down and watch the Steelers play this weekend, missed them the last two. Yesterday we celebrated Kaiden's Birthday party at Amy and Ralph's place. I definitely made it Picture Taking Moment with so many opportunities and I placed them up on my site. For a two year old little boy, I would say that he had a great birthday getting a lot of gifts and having a whole lot of family and friends around to play with him. The theme was Big Truck, and boy did he get a few big trucks. He was actually getting tired and they didn't have enough time at the party to honestly be able to keep his attention for the entire time. Today, well it's back to the grindstone for both me and Michelle. She's returning after being out and sick for the better part of last week. She is doing much better, but I wouldn't say she is 100% as of yet. yesterday Michelle and I went out and checked out a couple possible wedding venues that we are looking into using for next year. Our first stop was at Camp Muffly. A very nice place and we would have access to the entire area where the wine and jazz festival took place. It has a playground, three pavilions including a large grill and restroom facilities. There is also a pool on the site, so this is also a possibility. We both liked it, it was definitely spacious and provided shade for a hot summer August day. It was quite large which could be a negative thing, as we would have access to three pavilion, but one is quite a distance away from the other two. The other venue we checked out was Dorsey's Knob, not so much the lodge, but a pavilion on the grounds that has a very scenic view that could be used for the wedding and the reception. Ironically as we drove by yesterday they were actually setting up for a wedding at this location as you can see by the picture. We liked both places and have considered the pros and cons about both facilities. Dorsey's knob is a large park and is maintained by BOPARC. The restrooms are about as clean as I have ever seen at an outdoor facility anywhere. There is a lot to do at see around this property. The place does hold special meaning to me as it was the subject of my Senior Thesis in College, or at least the historical aspect of it all. For anyone who would want to turn around and venture to the top of the rock, I promise it will be well worth it as it is absolutely gorgeous up there. You feel like you are top of the world, but believe it or not even thought it may look like it from there, it is not the highest point in Mon County. We still have some time to decide which venue we want to use and at this time both are available for the time period that we want. I think me and Michelle are not planning on doing anything today other than resting. We have a birthday party to go to tomorrow and the WVU game is this evening when we travel to LSU, so today might just be a day of relaxation. I think we have both earned it, plus I don't want her over doing anything so she can fully recover before we have to return to work on Monday. I would like to take this opportunity to let everyone know that today is Kaiden Dalton's second Birthday. It's been two wonderful years ago today that he graced us all with his presence and we have all been better people since then. Amy and Ralphie are planning his birthday party this Sunday at their home. I have it on inside information that he wants a "Big Truck" for his birthday. First off, Michelle was released from the hospital yesterday and is now home safe and sound. Now onto football. Looking for some High School Football? University High tries to keep their unbeaten record in tact as they travel to Hedgesville tonight. Clay Battelle will host Clay Springs Maryland tonight for the nights other game. The Morgantown High Mohigans travel to Steubenville Ohio to take on National Powerhouse Steubenville Big Red tomorrow afternoon at 1:00. The Mountaineers travel to LSU for a game tomorrow night to take on the LSU Tigers in Baton Rouge. Sorry I couldn't post too many updates on Michelle yesterday, the Guest Connection for the internet at the Hospital is not working and I worked yesterday. She is still in the hospital and stayed once again last evening. She had both an Upper and Lower GI and they are going to perform another procedure today to look down into her stomach. To this point, we honestly do not know anything yet. The results so far have came back positive, yet she is still has some serious abdominal pains that is sidelining a very strong person with a large tolerance level. Hopefully we will find something more out today. Yesterday was just one of those days, I had a busy day at work scheduled and received a call yesterday morning that they were rushing Michelle to the hospital by Ambulance. We still do not know what is wrong with her, they are going to be doing a series of tests today to try to pinpoint exactly what was wrong. There were a lot of people to inform between her family, my family and close friends. Facebook became a very useful tool to be able to communicate what was going on with updates being able to reach as many people who should needed to know as possible. The response we got from her family, my family, and our friends was overwhelming and amazing. I had to come home to get my phone charger because I was answering so many phone calls. I would like to thank everyone for their concern, their prayers, their offerings of anything and everything to us. It was quite heartwarming to know that she has so many friends and family that were concerned about her well being. From both me and Michelle, once again thank you to all. * It's been 921 days since mine and Michelle's first date. * 144 days since our first date. * 95 Days left until Christmas. * 320 Days until our wedding. * Looking for something to watch on TV tonight? Turn it to channel 19 here in Morgantown (Comcast) to watch Versus. The subject of many of these blogs will be the closing pitcher tonight as the Columbus Clippers will be playing for the AAA National Championship tonight after winning the Governors Cup last week. Many of these players will be added to major league rosters after tonight's game. * Last day in my office this week for all of us to be there, by Thursday I will be the only one there for the rest of the week. Another fun filled weekend has come and gone. Another weekend of enjoyment, and relaxation, but in my case there was a little bit of illness associated with it. On the football front the Mohigans, Mountaineers and Steelers were all victorious for the weekend making my football weekend a successful one. Can't say as much about my fantasy teams, but the weekends games are not over with as of yet either. As a heads up on a multiple time subject on my blog. Josh Judy will be playing Tomorrow night on Versus TV (Channel 19 on Comcast) for the AAA national Championship after his Columbus Clippers recently won the Governors Cup. He'll be on tomorrow night, catch him if you can. Yesterday Michelle traveled to the Metropolis of Wana West Virginia for Ang's bridal Shower. She said that it turned out rather well and that she had a pretty good time. While she was doing that, I was in front of the TV watching WVU beat Maryland 31-17 at Mountaineer Field. I would have to say we played a very solid first half of football. On to day, We'll be traveling to Core WV for Calvin's Birthday party at 2:00. We will probably have it tuned into a station carrying the Steelers game which starts at 1:00. All of this after our normal Sunday morning routine. I would like to take this opportunity to wish my Nephew Calvin Michael McClain a very Happy Birthday today. Pam and George will be hosting his birthday party tomorrow instead of today because of a few event conflicts like Ang's bridal shower and the Mountaineer Football game that is being played today in town. If you see or talk to Calvin today, make sure you wish him the very happiest of Birthdays. Did someone say football? The Undefeated Morgantown Mohigans travel to east Fairmont this evening to take on East Fairmont in a battle that could also be called a game between two of the areas best bands. The University High Hawks are at home and hosting Elkins and Hundred travels to Blacksville to play Clay Battelle. You say you want college? Bring on the Terrapins again. After a couple year Hiatus in the series, the Maryland Terrapins return to the schedule with a game Saturday in Morgantown. It's nice to see the turtles back on the schedule. Pro Football? The Steelers travel to the play the Tennessee Titans on Sunday to round out the weekend of local football interest, other than Fantasy Leagues and their results. Well, Michelle and I have set a date for the wedding, our next step will be to assemble our guest list with addresses and information about everyone. So to do this I have set up am email address for us that we would like to use to use as a central e-mail address for both me and Michelle at wedding@george-hall.net. For anyone reading this, I would ask if you think In have your address or not to e-mail your contact information (address, Phone Number, e-mail) to this address so we can start to populate out guest list database. We ask this so we can get an idea of how many people we will possibly have to entertain (this is NOT the invitation, nor confirmation that you will or will not attend, it is only to populate the database for potential invitees), this will help us start gather the information we need so we can move on. 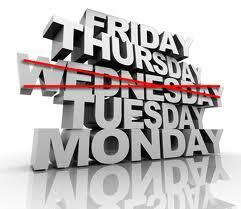 Well it is hump day, we are just about ready to cross over the hump and head towards another fun filled weekend. The week at work has been going pretty smooth for me so far, I may be upgrading to ArcGIS 10 today at work. We have the licensing issues worked out and have it installed on one of the machines we don't use as a test machine and everything appears to be working fine. I'll probably be migrating from 9.31 to 10 today. Other than that it's been a pretty uneventful week for me at work. Couple Hurricanes in the Atlantic, but nothing to get too excited about because of their locations. I hope everyone elses week is going well for them. * Monday is now behind us and it's Tuesday, sounds like a great time to do a tidbits. * It's been 914 days since me and Michelle had our first date. * We were engaged 137 days ago and to those who think these days are counting towards something else you are incorrect, it is only days since a milestone. * If you are curious, we have 326 days until the wedding on August 6, 2011. * We have 102 shopping days until Christmas. * I have been feeling a little under the weather the last couple of evenings, haven't missed work or anything like that, just not felt 100%. * An Early Happy Birthday to Michelle's niece Amanda who will be celebrating her birthday tomorrow. * Ang is having her Bridal Shower this Saturday at 4:00 and Pam will have a Birthday party for Calvin on Sunday even though his Birthday is actually Saturday. * The Mountaineers play at Home against the Maryland terrapins Saturday and the Steelers will play at the Tennessee Titans on Sunday. * How is that for tidbits? Another fun filled weekend has come and gone. It's left the world of reality and now exists only in our memories. It's time to put the nose back on the grindstone and get back to work. It was a good football weekend for me, the Mountaineers, Mohigans and Steelers all managed to win their games. WVU and the Steelers both won in OT and the Mohigans are returning to the Mohigans of old and just beating everyone pretty soundly. Fantasy Football is looking good so far for me to pick up a couple of wins in the head to head leagues and I put up a couple good point totals in the other leagues. The one that matters, my money league I'm happy with the start of the season. It's once again a peaceful Sunday morning, one where Michelle and I will go out and grab our weekly breakfast someplace before we go and do the weeks grocery shopping. Today however at 1:00 is the start of the Pittsburgh Steelers 2010 season with a game against the Atlanta Falcons. Dennis Dixon will make the start at QB for the Steelers today as Big Ben is serving out his four game suspension. Hopefully we can bring home the first W of the year today. We had a great time at the Wine and Jazz Festival yesterday. I think we both have a similar favorite wine with Daniel Vinyards and their blackberry wine, but it's not available anywhere in the northern part of the state. The Wine Rack here in Morgantown is trying to get their wine to carry. Phil and Jess, a couple of friends we met there were also impressed with this winery. Hope everyone has a great day and go Steelers. 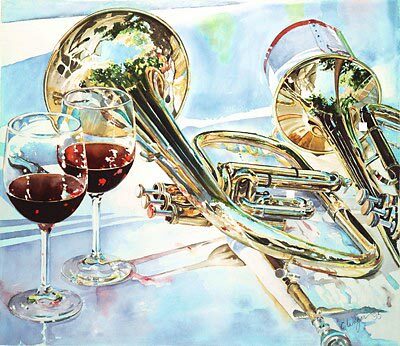 Today Michelle and I will be attending the West Virginia Wine and Jazz Festival at Camp Muffly. Michelle has never been to it, and I have been to a couple of them, so we decided to take our new interest in wines to the Festival for a day of tasting some of the local wines. I think for me it all started with a trip to the Breitenbach Winery last month and actually finding a few wines that I do in fact like. It's not that often that I found something that I honestly liked, but that was the start of it for me and my wine tasting. Hopefully it should be a much more relaxing day than I had last night watching WVU come back to beat Moo tech in overtime 24-21.
es it is once again that time of the week that we all look foreword to, when we can take time to cease the labors for the week and take a little bit of needed time out to enjoy the fruits of those labors. It is once again the dawn of another weekend and a Big Ole Hairy Friday. High School football has been moved all around since WVU and Moo Tech play on Friday night. Morgantown will host Fairmont Sr tomorrow at noon and University High played at Buchanon Upshire last night. Clay Battelle hosts Paden City this evening. Tomorrow and Sunday at Camp Muffly, the 2010 version of the Wine and Jazz festival will be taking place. Michelle has never been to the Festival so we will probably be stopping by to taste a few of the wineries wines. Michelle's Brother in law and Sister will have an Estate Auction tomorrow with a lot of really nice stuff up for bid. Michelle and I have finally started making plans for the wedding. We spoke about a theme this past weekend and you can probably use this picture as a hint as to what it is going to look like. Not finalized on that yet, but we are leaning towards that non-traditional theme. A Date everyone asks, well we have finalized a date. Michelle has wanted a fall wedding but Mountaineer Football was a big inhibitor in setting a date during that time. Michelle's family takes their yearly vacation during a certain week in August so that time period was eliminated which lead to our date. August 6, 2011 will be the day Michelle and I tie the knot. Mark your calenders, set aside this Saturday and get ready to celebrate our Union. On December 3rd 1989 I received a piece of news that left my life in a tailspin for a year. I was getting laid off from a job that I had worked for at that time for the past 7 1/2 years. My day of final fate would be almost seven months later, but it was a day that changed my life. My world as I had come to know it was about to change. Span ahead another seven years and I had been working the last six years working 65-70 hours a week at another steel mill in Fairmont. I had sold my life for for employment and I was going full steam ahead planning on retiring from this company with an executive position. Once again, my life was placed into a tailspin as only a hand full of us were left to do the jobs of 70 people making the foundry go and for a lot less money. It eventually ended also once again making my head spin. Since the days of me working in steel mills, living paycheck to paycheck and hanging on by a decision that someone else would make about my fate and future a lot has changed. I went to college, worked for a few great companies, the one I currently work for is by far the best. Within a few short months of me first going to the DOE, I had an animation that I played a big part on developing playing in the White House and was witnessed by two administrations. That was a big jump forward for a guy who was twice laid off from two different steel mills. Today, I guess you can say I move a little further in that Journey. It seems like just yesterday I was in meetings with my foreman being told about a plant shut down. Today is a whole different story, today I have the honor of sitting in a meeting with the US Secretary of Energy Stephen Chu (Probably the single most visible Secretary of Obama's administration), Senator Rockefeller (who I saw once as he walked through my department at Sterling) and Governor Manchin as definite people who will be in this meeting. Possible other attendees include one other US Senator, and possibly one current member of the House of Representatives. As I look back at yesteryear and the days of bad news, and realize just how far I have come since December 3, 1989. I think the worst thing about a nice long weekend is that eventually they have to end. The weekend that unofficially marks the end of the days of summer and enter us into the days of autumn has just passed. It's officially goodbye to my favorite time of the year to enter into what is considered the most beautiful time of the year around these parts. It's Tuesday after Labor Day. It's back to work, it's also a time to talk about the football games of the weekend and talk about what we did or did not do. It's a time when students have to get serious for the next few months and we notice a lot more Hurricanes at work. It's unofficially fall, and it is time to get ready for full time football on the weekends. Happy Labor Day to everyone, I hope all of you who have the opportunity to take this day off enjoy your day. Both me and Michelle are off today, but she has been battling being ill or sore this entire weekend. Her Trapezius Muscle has been extremely sore since Saturday afternoon. It pretty much hit her all at once and she has been in very bad pain since Saturday Afternoon. Last night she actually turned the AC off (this is a girl who could freeze out a penguin) and went to the rest room. She came down with a bad case of the stomach flu on top of her neck pain. She hasn't had a very relaxing time off. Today we have nothing planned, probably waiting to see if she can heal up before returning to the grindstone tomorrow morning. 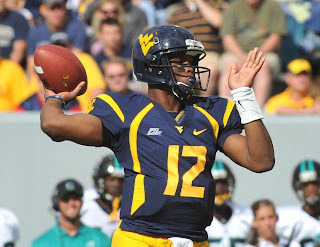 Well Bill Stewarts edition of the 2010 West Virginia Mountaineer football team started off with an opening day 31-0 win against the Coastal Carolina Chanticleers yesterday at Mylan Puskar Stadium at Mountaineer Field. It was the first shutout pitched by the defence in a number of years and only the 3rd in the past 13 seasons. The Mountaineers will return to action this Friday evening as they travel to Huntington West Virginia to take on the Marshall Thundering Herd. 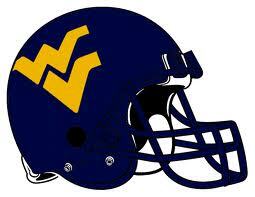 It's gameday here in Morgantown.It's the season opening day and game for the 2010 version of the West Virginia Mountaineer Football team. Senior Noel Devine will be leading the Mountaineers on the field today against Coastal Carolina for a 3:30 kickoff at Mountaineer Field. I'm sure there will be a sea of Gold and Blue all over the place. Game is available here locally on Comcast channel 22, WPCW. Yes it is once again that time of the week that we all look foreword to, when we can take time to cease the labors for the week and take a little bit of needed time out to enjoy the fruits of those labors. It is once again the dawn of another weekend and a Big Ole Hairy Friday starting a THREE DAY WEEKEND!!!!!!!! 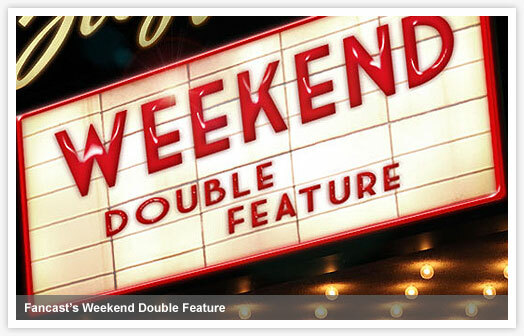 Yes, it is a holiday weekend for both me and Michelle and we are going to be celebrating a nice relaxing three day weekend. Maybe watch a little football like last night and the Steelers. High School Football is on tap for this evening. The Mighty Morgantown Mohigans are at home and will host Elkins tonight at Pony Lewis Field this evening. University High travels to Fairmont to play East Fairmont and Clay Battelle travels to Bishop Donahue. Let's hope the Mohigans and Hawks keep their winning streaks alive in week two and the CB's can start a streak of their own. Soccer fans, the WVU men's Soccer team plays this evening at the Soccer Stadium. Hi ho hi ho, let's get this Holiday Weekend started. I was talking to a co worker yesterday about some athletic jersey's. He told me about this site that a friend of his bought some very nice stitched jersey's called BornTrade. Jersey's are $25-$28 for College stitched WVU or stitched NFL jersey's. Here is the catch, shipping is $25.00. If you buy 1 or 9 Jersey's, shipping is $25.00. However if you order 10 ($250.00 in sales) shipping is then free. I'm thinking about ordering a couple, Michelle might order a couple and Scott said he wants one. If we can get a group of 10 together we can get a really nice stitched jersey (Scott has seen them compared to an Authentic and said they are nicer than the authentic ones). Take a good look at the site, and let me know if anyone is interested in ordering a really nicer Jersey. Steelers and WVU Fans encouraged to buy a very nice Jersey. OK it's hump day, three more days to work and then three days off from work to celebrate the holiday weekend. We're getting closer and closer, but today it's a trip over that dreaded hump. We got the cats back yesterday from the Vet, we had them spaded and I'm happy to report they are both doing fine, walking kind of sideways, but they are still doing fine and are both expected to make a full recovery and spent yesterday afternoon and evening drugged up and sleeping. I hope everyone else's week is going smooth for them, I've been busy, challenged but definitely busy developing some presentation material for the TouchTable at work.